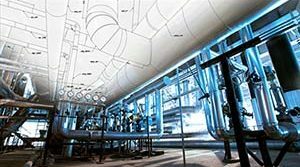 Replacing a Spring Coil With Stainless Steel Bellows | Piping Technology & Products, Inc.
Spring coils are so pervasive in design of pipe supports that our collective paradigm limits our ability to consider alternatives. 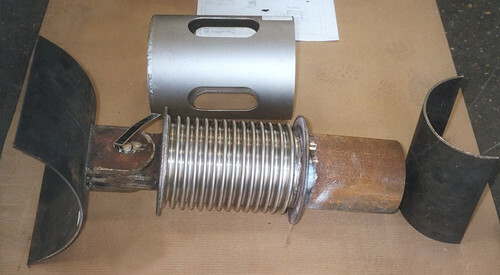 The photograph below shows an example of a pipe support designed for the special environment of an off-shore platform which uses a stainless steel metal bellows instead of a spring coil. This customer was concerned about the corrosive environment and the salt water which will occasionally flow over the pipe support. The rolled plate on the left will be welded to a structural pipe on the platform. A riser clamp (not shown) will be attached on the right. 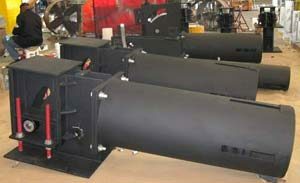 The stainless steel bellows was designed with the proper spring rate and movement. In need of a spring coil? Let us price one for you today!